Personal attention to your matrimonial and custodial issues The Law Office of Robert G. Venturo is known for its practical, as well as expert, guidance in all areas of Family Law and Matrimonial Law. Our founder, Robert G. Venturo, has personally handled almost 1,000 custody cases, representing both adults and children as their Law Guardian, in the Supreme, Family and Surrogates Court of New York State. He is a highly regarded and experienced Trial Attorney having tried over 100 cases in his carreer. Many of his cases have gained recognition and have been reported in the Appellate Division for the Second Judicial Department of New York State. Just as important, he listens to your concerns, responds to you directly and earns your trust. He has almost 20 years of experience working with individuals and families on Long Island to address delicate personal matters. Mr. Venturo has been presented with many honors and awards throughtout his carreer for his service to his clients and the community. Our Law Firm has grown quickly and is considered by many to be one of the best on Long Island. Our Law Office welcomes people from all walks of life who need to resolve difficult family problems. Managing the challenges of marriage and children In addition to our founder Robert G. Venturo , our firm recently has the pleasure of proudly announcing Former Suffolk County Family Court Judge (1997-2007) Honorable Ettore Simeone as of counsel to the Firm. Mr. Simeone has amazing credentials as a former: Suffolk County Assistant District Attorney; Law Secretary to Supervising Justice of the Supreme Court of New York State; and most recently, Family Court Judge in New York State, Suffolk County. These highly skilled and experienced family law attorneys know how to ease you through the painful experience of divorce, and we place a special emphasis on child custody. We offer aggressive and zealous representation, yet are sensitive to our clients needs and their very personal issues. Additional legal services for your family While our firm is primarily recognized for its matrimonial, family law and criminal practice, we form lasting client relationships and offer a broad range of legal services. Our lawyers provide criminal defense as well as real estate representation. We welcome the opportunity to be your full-service family lawyers. Help is available in Suffolk and Nassau counties We serve all of Long Island from our brand new, beautiful Patchogue office, located in central Long Island, where our staff maintains an upbeat and friendly atmosphere. We can also travel to you anywhere in Suffolk or Nassau counties. Robert G. Venturo is known and well respected by his loyal clients and his colleagues within the court system. Let us help you and your family overcome legal problems The Law Office of Robert G. Venturo is responsive and available, with flexible hours including weekends and evenings. Contact our office online or call 631-234-0800 now to schedule a free consultation. Long Island attorneys who help you handle sensitive issues Family Law refers to all matters addressed in Family Court. The Family Court's in Suffolk and Nassau County have jurisdiction over: Custody Cases; Child Support and Paternity Proceedings; Child Protective (CPS) Neglect Proceedings; Orders of Protection; Juvenile Delinquency Proceeding; P.I.N.S. Proceedings and Adoptions. The Suffolk County Family Court is located in Central Islip and Riverhead, just 15 and 20 minutes from The Law Office of Robert G. Venturo. Nassau County's family court is in nearby Westbury, approximately 35 minutes away. Our attorneys regularly handle Long Island family law matters in each of these locations, where we are well-regarded and respected by our colleagues and clients. Child support When a parent, whether a father or mother, have no domestic relationship with the custodial parent of their child, they are required by law to pay child support. New York State adopts the Child Support Standards Act (C.S.S.A.) which provides child support guidelines, though parents may agree to deviate from them. Our lawyers can help you negotiate an appropriate amount of child support. We will also aggressively pursue and prosecute cases against "deadbeat" parents who are delinquent or simply refuse to pay their child support obligation pursuant to court order. In many of these cases, our Law Firm has sucessfully recovered legal fees when a parent willfully violates an Order of Child Support. Paternity A father who is not married to his child's mother has no parental rights or responsibilities unless paternity is legally established. Our attorneys assist: Fathers who want to establish paternity and assert their custody rights Mothers who must prove paternity to request a child support order A willing father may sign an Acknowledgement of Paternity, or an unwilling father may be compelled to accept an Order of Filiations after undergoing a genetic marker (DNA) test to determine if he is the biological father of the child. Juvenile delinquency Crimes committed by children ages eight to 15 are handled and prosecuted in the family court. The process is similar to adult criminal court, but with different terminology that avoids terms such as "crime" and "defendant." Still, juvenile delinquency (JD) proceedings can have major consequences, including incarceration. Our lawyers help keep your child out of confinement, and in serious cases we fight to keep the charges from being moved to adult criminal court. Very often these cases proceed to trial. Our office has substantial trial experience in JD proceedings and has been successful in having cases dismissed against some of these children. Order enforcement and modification Family court orders are not monitored for compliance, and changes cannot be made without permission of the court. Our attorneys can help you: Enforce a court order when the other party is not upholding its terms Obtain a modification of an order when new circumstances justify the change We can handle enforcement and modification of all family court orders, including child custody, child support and spousal support. Rely on our personable attorneys to handle your family law needs The Law Office of Robert G. Venturo handles all family law matters, including adoptions. For help with your most personal concerns, contact our office online or call 631-234-0800 for a free consultation. Founding attorney Robert G. Venturo grew up on Long Island and has practiced law here for almost 20 years. Having handled over 1,000 custody cases in his nearly 20 year career, his extensive experience and expertise will help you navigate the local Family Court and Supreme Court system and improve your personal legal situation. Mr. Venturo will represent you aggressively and competently, while always remaining sensitive to your particular personal needs. If your case cannot be resolved favorably by a mutual settlement, then your particular case must proceed to Trial. Mr. Venturo has personally tried over one-hundred (100) cases and is a highly regarded Trial Attorney by his colleagues, his clients and members of the Judiciary. In 2002, he was awarded the "Suffolk County Law Guardian of the Year" award by the Suffolk County Bar Association. Most recently he was honored by the Suffolk County Court Officers Association as "Attorney of the Year" for 2013. He is a member of the New York State Bar Association and the Suffolk County Bar Association. He actively serves on local Bar Association committees concentrating on areas of Family, Matrimonial and Criminal Law. In 2013, Mr. Venturo was appointed by the Suffolk County Bar Association to Co-Chair the Family Law Committee of the Suffolk County Bar Association for 2013-2014. He was re-appointed to Co-Chair that Committee for 2014-2015 where he has been actively proposing new rules for attorney's for children, formerly known as Law Guardians. Robert G. Venturo began his career in Criminal Law interning in the District Court Bureau of the Suffolk County District Attorney's Office between 1992 and 1994, gaining insight into the real problems that individuals and families face within the criminal justice system. He also saw married couples struggling to handle their divorces and he observed the impact of matrimonial conflict on families and especially children. His concern for the well-being of children led him to focus on family law with a strong emphasis on child custody and protection. He built his practice with the specific purpose of working with families in need of guidance and children in need of legal representation. Robert G. Venturo has been a law guardian, also referred to as the Attorney for the Child, for over 15 years, representing hundreds of children in child custody proceedings, juvenile delinquency proceedings, PINS proceedings and child protective proceedings in the Supreme, Family, and Surrogate's Court of New York.. When he was appointed to this role by the State of New York, he did not yet have children of his own. He is now happily married and the proud father of two. He enjoys caring for his own children as well as those who require guidance in the legal system. When you decide to hire us, we make ourselves available to you. We are here 24 hours a day in case of emergencies or urgent situations. Robert G. Venturo has often been known to give out his personal cell phone number and email address! You can expect to make a close personal relationship with an attorney who genuinely cares about you and your family. Contact The Law Office of Robert G. Venturo online or call 631-234-0800 now to schedule a free consultation with Robert G. Venturo. 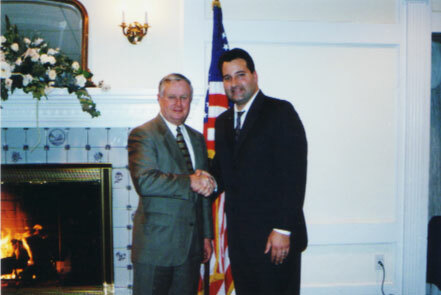 Pictured with Mr. Venturo is Suffolk County District Attorney, Thomas Spota.